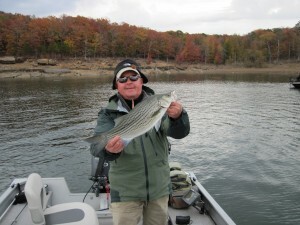 The Hybrid fly fishing on Greers Ferry Lake continues to be on fire! 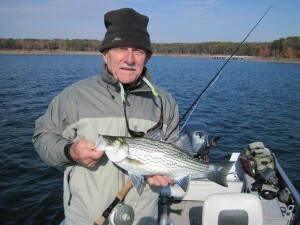 We spent the last couple of days chasing the Hybrids around the lake with our old friend Paul Broddick. This was not Paul’s biggest Hybrid; but it was his first Hybrid On the Fly! The fish are in full Blitz mode and just crashing the shad on the surface and the water just boils. It is a sight to behold! The weather has been great and the fall colors of the trees around the lake are just spectacular.